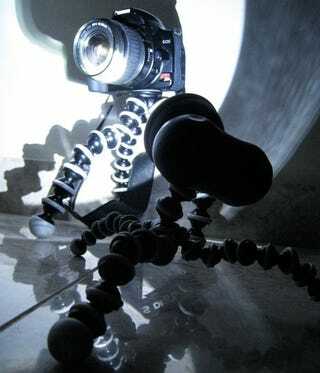 We've all heard of Joby's renowned Gorillapods, the tough, highly flexible ball socket tripods that fit everything from dSLRs to PSPs. The Gorillatorch takes this same basic idea and pops on magnet feet and a bright LED head. It's handy, even if we'd like to see the price drop by $10. Taking the Gorillatorch out of the box, my immediate reaction was that it was a bit smaller than I'd expected. Especially compared to their dSLR tripod, pictured here, it's a little guy. But the small size isn't necessarily a bad thing. Coupled with bright light output (that will blind you head-on) and feet that will stick firmly to metal surfaces (seriously, if you twist the light, the legs flex while the feet stayed glued), it's incredibly multifunctional. You can wrap or stick the torch almost anywhere you need some extra light. I also loved the six-shooter style AA battery compartment. Of course, this is an LED light. And that means it's more of a spotlight than a warmly diffused bulb. Reading requires creative positioning to avoid the overexposed center. Luckily, the LED is on a dimmer, so you can tweak the output pretty aggressively.